A patch of Indian Blankets on the banks of the Pedernales River. It has been a picture perfect spring week in Austin, so, with a few free days on our hands we decided to go camping. Camping is great for the change of scenery, exercise, fellowship, and food. Half the fun of the endeavor is to build a fire and make a hot meal in natural surroundings as our common primitive ancestors did in eras gone by. For our temporary escape from civilization we sought refuge at Pedernales Falls State Park about an hour west of Austin in the hill country. 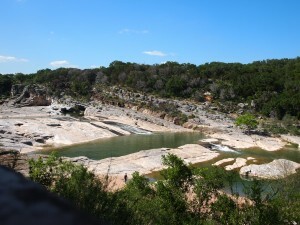 The park is famous for its falls and pools that the Pedernales River has carved out of the limestone bedrock. 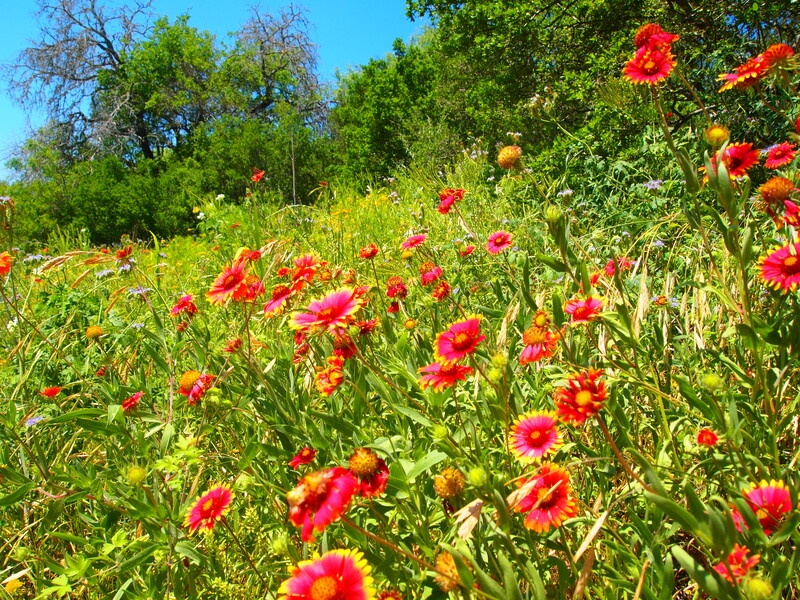 This time of year it is also a great place to view the spring wildflowers and wildlife. Since the trip was simply an overnight car camp we decided to seize the opportunity to test out some new camping recipes. We picked dishes that could be prepped ahead of time and cooked over a charcoal grill which are available at all of the Park’s developed sites. For lunch we packed sandwiches, fruit, and trail mix which we enjoyed while hiking around the Park’s loop trail that crosses the river and climbs a steep bluff offering views of the surrounding Hill Country. In the evening we had some homemade vegan Italian- style sausages and served them with grilled asparagus and portabello mushrooms that we packed in a simple Asian-inspired marinade. Dinner was of course accompanied by a campfire and some cold brews. For breakfast we tried a new experiment — Over our summer road trip James and I frequently enjoyed grilling eggs in bell pepper halves. For a healthier vegan take on that theme we grilled a tofu scramble in pepper halves over hot charcoal. It worked beautifully! These simple meals were delicious, filling, and just what we needed to fuel our venture into the great outdoors!